Bullets: the healthy, low-fat way to start your day. Everyone knows that eggs are delicious and filled with important nutrients, but it's impossible to deny that they're not very high-tech. 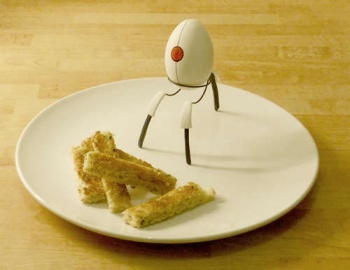 Thankfully, one Portal fan has a remedy for our breakfast time woes, with a homemade egg cup that recasts the humble egg as a sleek and stylish Aperture-brand turret. The egg cup is the work of Instructables user, Supernewby, who designed it for the site's "Egg-Bot Challenge." It's a simple but elegant design, made mainly out of floral wire, with modeling clay accents. Supernewby bent the wire around a variety of forms until he had the shape he wanted, and then glued on the clay pieces. The only downside is that in order to get the full turret effect, you have to draw a watchful red eye on each and every egg you eat. That said, as you can see from the picture, the egg turret is so charming, you just might decide it's worth it. If you want to make your own turret egg cup, you can find full step-by-step instructions here. You don't have to just use white eggs either, because, as Cave Johnson says, turrets come in hundreds of designer colors, like "Forest," "Desert" and even, "Table." I want 3 of those please. I'd totally paint a few soft boiled eggs and make an aperture sentry breakfast. Bonus points for playing Portal 1/2 music while eating. "I don't hate you.......for being delicious!" Eggs have never looked so adorable. Can I get "who the heck authorised this..." colour? Seriously, that is so awesome I might start eating eggs again! Definitely - my first reaction was "awwww, so cute!" Very awesome though, very well made! I want mine to be coloured "evening at the improv". Eggcelent! I've been looking for a way to Science-up my breakfast. It certainly looks egg-syting, along as it's not just a yolk report. Then I've just had un ouef. We're going to eat eggs! Getting this godlike object is now my top priority. I just want mine boxed up and shipped straight to my doorstep, so it can protect the things that matter most. Just try and get close to those bread soldiers. I'd totally be willing to shell out for one of those! You crack me up, little buddy; but no more poaching my best puns, or it will be eggsasperating. Sorry I had to do it! Strange. I've developed a minor addiction to soft-boiled eggs in the past few weeks. This is very timely. Great! And instead of bullets, this turret is filled to the brim with proteins! I love you and all your one liners...Have my babies...I mean, keep up the good work! This is awesome, I may make one and sneak into my friends house, muhaha...Don't even like eggs. Did ya know just one egg has over half the daily recommended amount of cholesterol? That said this is pretty freaking adorable. I need to find some white plastic hollow eggs, and fill them with candies and make this! It's a good way to start the day with an unhealthy dose of science! What am I saying? There's never an unhealthy dose of science! I love that site, I made a Spiderman Flame-slinger from there, and made a replica Portal Gun that I took to the P2 midnight release! Sweeeeeet. Couldn't you make another wire running vertical to attach the "eye" to though? then every egg could shell you. His jokes are Eggsistential to my daily dose of comedy! Oh god, he's got everyone doing it now. Yeah, it looks cool. Hardly impressive though. The guy drew a red dot on an egg and sat it on a piece of stylised wire. I'm not overwhelmingly eggcited by this article. You forgot the "Evening at the Improv" and "What Idiot Picked You?!" designer colours (although you'd be hard pressed to find that kind of egg). It it was Table colored you wouldn't be able to find it once you set it down. You get 63% more protein per protein. Just try getting near that breakfast. It's your funeral.